1 A None No Power Seat 1 A is a standard Premium Economy Class seat however, the proximity to the lavatory and galleys may be bothersome. 1 B None No Power Seat 1 B is a reserved seat where no passengers can sit. This seat offers extra room for Premium Economy passengers. 1 C None No Power Seat 1 C is a standard Premium Economy Class seat however, the proximity to the lavatory and galleys may be bothersome. 10 D None No Power Seat 10 D is a standard Economy Class seat that has limited recline due to the exit row behind. The proximity to the lavatory may be bothersome. 10 E None No Power Seat 10 E is a standard Economy Class seat that has limited recline due to the exit row behind. The proximity to the lavatory may be bothersome. 10 F None No Power Seat 10 F is a standard Economy Class seat that has limited recline due to the exit row behind. The proximity to the lavatory may be bothersome. 11 D None No Power Seat 11 D is a standard Economy Class seat that has extra legroom due to the exit in front however, the proximity to the lavatory may be bothersome. 11 E None No Power Seat 11 E is a standard Economy Class seat that has extra legroom due to the exit in front however, the proximity to the lavatory may be bothersome. 12 A None No Power Seat 12 A is a standard Economy Class seat that has extra legroom due to the exit in front however, the proximity to the lavatory may be bothersome. 12 B None No Power Seat 12 B is a standard Economy Class seat that has extra legroom due to the exit in front however, the proximity to the lavatory may be bothersome. 12 C None No Power Seat 12 C is a standard Economy Class seat that has extra legroom due to the exit in front however, the proximity to the lavatory may be bothersome. 2 B None No Power Seat 2 B is a reserved seat where no passengers can sit. This seat offers extra room for Premium Economy passengers. 2 D None No Power Seat 2 D is a standard Premium Economy Class seat however, the proximity to the lavatory and galleys may be bothersome. 2 E None No Power Seat 2 E is a reserved seat where no passengers can sit. This seat offers extra room for Premium Economy passengers. 2 F None No Power Seat 2 F is a standard Premium Economy Class seat however, the proximity to the lavatory and galleys may be bothersome. 21 A None No Power Seat 21 A is a standard Economy Class seat that is missing a window. 21 F None No Power Seat 21 F is a standard Economy Class seat that is missing a window. 24 A None No Power Seat 24 A is a standard Economy Class seat that may have limited recline due to the exit row behind. 24 F None No Power Seat 24 F is a standard Economy Class seat that may have limited recline due to the exit row behind. 25 A None No Power Seat 25 A is a standard Economy Class seat that has extra legroom due to the exit however, may also have limited recline due to the exit row behind. 25 B None No Power Seat 25 B is a standard Economy Class seat that has extra legroom due to the exit however, may also have limited recline due to the exit row behind. 25 C None No Power Seat 25 C is a standard Economy Class seat that has extra legroom due to the exit however, may also have limited recline due to the exit row behind. 25 D None No Power Seat 25 D is a standard Economy Class seat that has extra legroom due to the exit however, may also have limited recline due to the exit row behind. 25 E None No Power Seat 25 E is a standard Economy Class seat that has extra legroom due to the exit however, may also have limited recline due to the exit row behind. 25 F None No Power Seat 25 F is a standard Economy Class seat that has extra legroom due to the exit however, may also have limited recline due to the exit row behind. 26 A None No Power Seat 26 A is a standard Economy Class seat that has extra legroom due to the exit. 26 F None No Power Seat 26 F is a standard Economy Class seat that has extra legroom due to the exit. 3 B None No Power Seat 3 B is a reserved seat where no passengers can sit. This seat offers extra room for Premium Economy passengers. 3 E None No Power Seat 3 E is a reserved seat where no passengers can sit. This seat offers extra room for Premium Economy passengers. 4 B None No Power Seat 4 B is a reserved seat where no passengers can sit. This seat offers extra room for Premium Economy passengers. 4 E None No Power Seat 4 E is a reserved seat where no passengers can sit. This seat offers extra room for Premium Economy passengers. 40 A None No Power Seat 40 A is a standard Economy Class seat that has extra legroom due to the exit however, the proximity to the lavatories may be bothersome. 40 B None No Power Seat 40 B is a standard Economy Class seat that has extra legroom due to the exit however, the proximity to the lavatories may be bothersome. 40 C None No Power Seat 40 C is a standard Economy Class seat that has extra legroom due to the exit however, the proximity to the lavatories may be bothersome. 40 D None No Power Seat 40 D is a standard Economy Class seat that has extra legroom due to the exit however, the proximity to the lavatories may be bothersome. 40 E None No Power Seat 40 E is a standard Economy Class seat that has extra legroom due to the exit however, the proximity to the lavatories may be bothersome. 40 F None No Power Seat 40 F is a standard Economy Class seat that has extra legroom due to the exit however, the proximity to the lavatories may be bothersome. 48 C None No Power Seat 48 C is a standard Economy Class seat however, the proximity to the galley may be bothersome. 48 D None No Power Seat 48 D is a standard Economy Class seat in the last row of the aircraft that may have limited recline. The proximity to the galleys may be bothersome. 48 E None No Power Seat 48 E is a standard Economy Class seat in the last row of the aircraft that may have limited recline. The proximity to the galleys may be bothersome. 48 F None No Power Seat 48 F is a standard Economy Class seat in the last row of the aircraft that may have limited recline. The proximity to the galleys may be bothersome. 49 A None No Power Seat 49 A is a standard Economy Class seat in the last row of the aircraft that may have limited recline. The proximity to the galleys may be bothersome. 49 B None No Power Seat 49 B is a standard Economy Class seat in the last row of the aircraft that may have limited recline. The proximity to the galleys may be bothersome. 49 C None No Power Seat 49 C is a standard Economy Class seat in the last row of the aircraft that may have limited recline. The proximity to the galleys may be bothersome. 5 B None No Power Seat 5 B is a reserved seat where no passengers can sit. This seat offers extra room for Premium Economy passengers. 5 E None No Power Seat 5 E is a reserved seat where no passengers can sit. This seat offers extra room for Premium Economy passengers. 6 B None No Power Seat 6 B is a reserved seat where no passengers can sit. This seat offers extra room for Premium Economy passengers. 6 E None No Power Seat 6 E is a reserved seat where no passengers can sit. This seat offers extra room for Premium Economy passengers. 7 B None No Power Seat 7 B is a reserved seat where no passengers can sit. This seat offers extra room for Premium Economy passengers. 7 E None No Power Seat 7 E is a reserved seat where no passengers can sit. This seat offers extra room for Premium Economy passengers. 9 A None No Power Seat 9 A is a standard Economy Class seat however, the proximity to the lavatory may be bothersome. 9 B None No Power Seat 9 B is a standard Economy Class seat however, the proximity to the lavatory may be bothersome. 9 C None No Power Seat 9 C is a standard Economy Class seat however, the proximity to the lavatory may be bothersome. 9 D None No Power Seat 9 D is a standard Economy Class seat however, the proximity to the lavatory may be bothersome. Overhead TVs are located throughout the aircraft in each class. 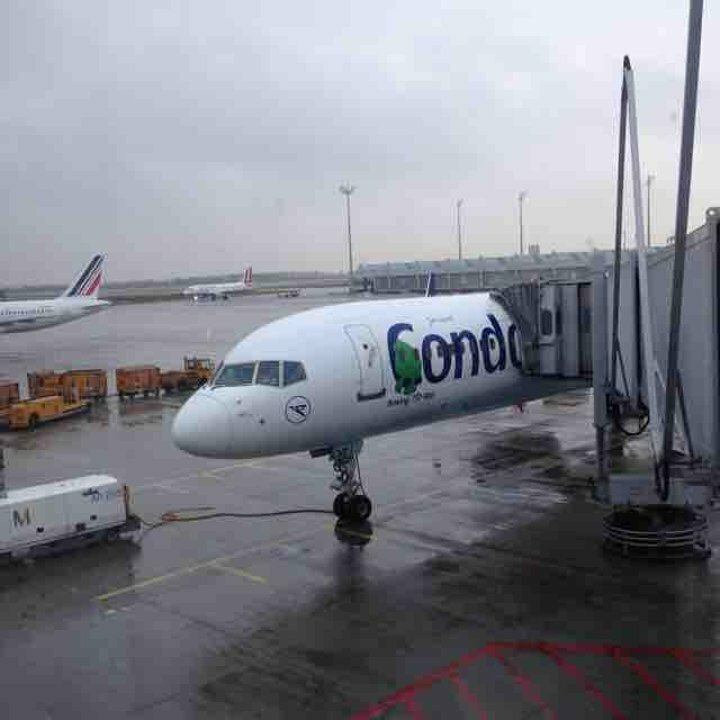 Condor Flugdienst flies their Boeing 757-300 in a two class configuration with up to 26 Premium Economy seats, and 236 standard Economy seats. Legroom is very large. Seat is nearby the door, so you don´t have a window. The near to the toilet is terrible, every time the door gets open the smell of poo reached the seats arround. Seat has extra leg room space (emergency exit row) and i needed to pay an uplift of 29,99 Euro. However the seat depth is short. I am above 190 cm and could not sit any more after three hours. The seat depth is a pain for me in this aircraft configuration. I don't need this again. The smell from the toilet was terrible, with every door opening a breeze of poo came over! That is a terrible seat. The smell also reached the passengers in rows 9 and 11, so all three rows are definitely to be avoided! 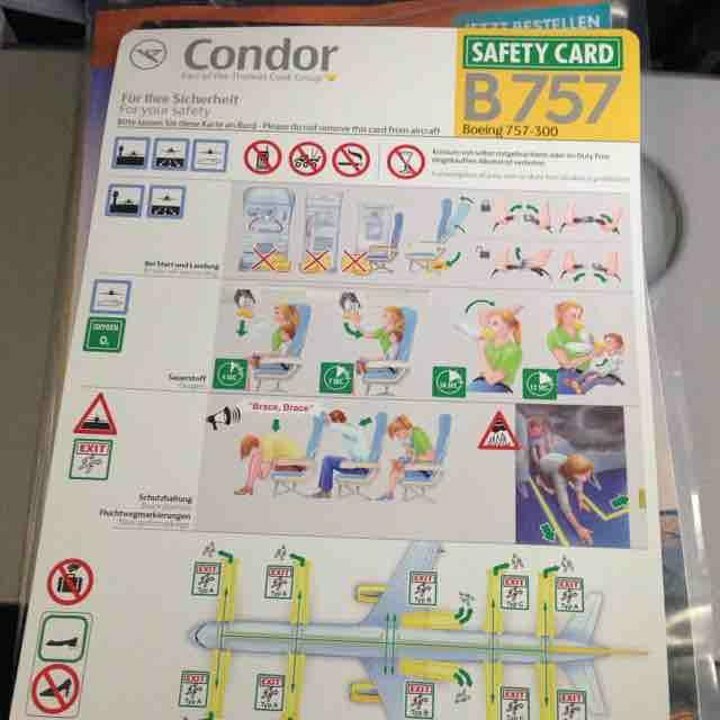 Condor flies 1 versions of Boeing 757-300.